I truly enjoyed this story. It was so much fun and so well written. You can feel both Corey and Lon’s emotions throughout the entire book. Plus the story was so well described you felt like you were there in many of the scenes. I enjoyed Ms. Singer’s writing style and will definitely be picking up more of her books in the future. Corey was a total sweetheart. He loved Lon deeply even if he had to readjust his way of thinking some as he learned to deal with a shifter for a boyfriend. 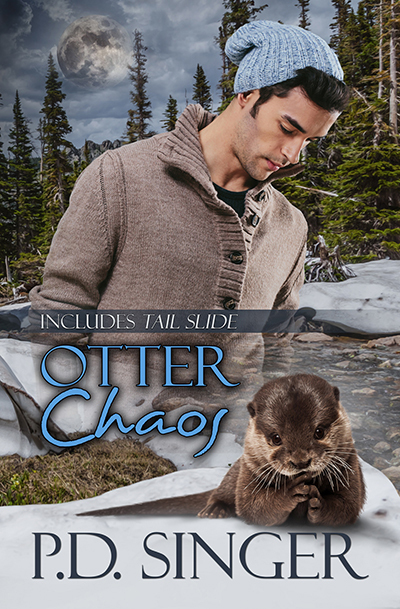 His fear when Lon was threatened, his love for Lon, his squeamishness in regards to otter things; all of those emotions came through so clearly you could feel them too. He was also unsure sometimes on how to react to Lon’s otter and what that meant practically. I adored the final scene because you can tell how deeply happy Corey is. I absolutely loved Lon. He was such a fun and dynamic character. He embodied his otterness and is exactly what I would imagine an otter to be like in human form. He was so well written. You wind up feeling like he’s a friend by the end of the story. Watching him struggle to come back from his ordeal was rough. I enjoyed the brief glimpses we got when Lon was shifted and how his thought process changed. Especially when he spent longer times shifted than he regularly does. Lon and Corey are wonderful together without stepping on anyone’s toes or paws. They love each other deeply and are obviously willing to put the effort in to make the relationship last. I got attached to them a little bit in this story and would love to see more of them. I’d read the heck out of a sequel because Lon and Corey are so cute together. Lon jerked up hard enough to jostle Corey’s arm. Brown liquid slopped over the rim of the glass. At least it missed Lon’s instrument, but what—? “Now. Please.” Lon was up and sidling toward his guitar case. Corey followed. What else could he do? The man who’d been gleefully leading fiddles and mandolins had cased his instrument and bolted out the side door. Lon barely waited on the porch of the old house turned brewpub, dashing to the passenger side of the RAV4 before Corey was quite outside in the chill spring night. That again. “I did see Melvin come into the pub.” Corey aimed the truck toward south Boulder, because Lon had that trembly look where his dark brown hair and beard seemed to puff out bigger. Absolutely no reason to stress him, and every reason to take him home and pet him into exhausted, sweaty peace. “Rotten egg! Ick!” But Lon was diverted enough to scamper to the back yard, not too fast to be caught. P.D. Singer lives in Colorado with her slightly bemused husband, two rowdy teenage boys, and thirty pounds of cats. She’s a big believer in research, first-hand if possible, so the reader can be quite certain PD has skied down a mountain face-first, been stepped on by rodeo horses, acquired a potato burn or two, and will never, ever, write a novel that includes sky-diving. When not writing, playing her fiddle, or skiing, she can be found with a book in hand. This entry was posted in Reviews and tagged Author: P.D. Singer, HEA, Kidnapping, Location: Colorado, Molly Reviews, Paranormal, Profession: Bank Loan Officer, Profession: Economist, Rating: 4.5 stars, Shifters, Teachers. Bookmark the permalink.